Today you want to think about what it is you might be holding onto too tightly, and more importantly why. The Four of Pentacles can refer to a hoarding mentality, a poverty consciousness and a resistance to change. All of these end up creating blockages in your life, where your fear of letting things go can prevent new things from coming in. 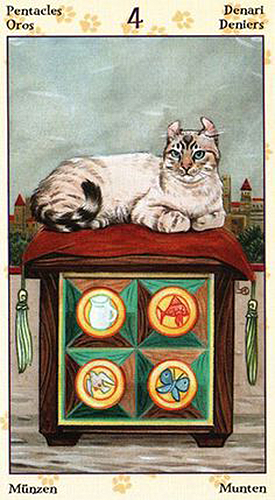 The cat in this card is not only protecting his territory (by sitting squarely on top of it), his ears are perked up and pulled back, a clear sign that he’s alert and guarded against any sign of danger. The pictures on the front of the box tell you his treasures are well worth protecting — as any cat could tell you. There’s a pitcher of milk, a fish, a bird and a butterfly. But notice how the box is closed up so tightly that nothing else (a little field mouse perhaps?) could possibly get in. Notice the landscape behind him. There’s a great big old world out there and what cat doesn’t like to explore? But this one can’t — he’s stuck where he is because he can’t run the risk of leaving his hoard unattended. In this regard the Four of Pentacles is also about trust — or the lack of trust more specifically. The implication is that someone could take something from you (something you’ve ascribed a false sense of value to), which prompts you to hold on even more tightly (or hide it away). With this in mind your challenge today will be to loosen up the reins a bit. Let the darkness (avarice, hoarding) out so you can let you some light (enlightenment, prosperity) in. Think about sharing what you have with others, or giving something back. Remember that the Universe does not appreciate a vacuum. All that you’re willing to let go of now will be replenished with something new in the end. And news flash: that’s not just money and material possessions. It also applies to negative thought processes, dysfunctional relationships and outdated ideals. 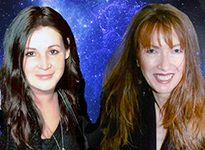 This deck comes from the talented artist Lola Airaghi and writer Magdelina Messina. Check out more daily tarot scopes or visit our Shop.